Take some Echeverias (E. imbricata), plant too many in one terracotta pot, have lots of rain and you have a scene of each plant doing its best to be the biggest! I have found E. imbricata to be a fast grower, producing healthy plants and actually spreads like wild fire. 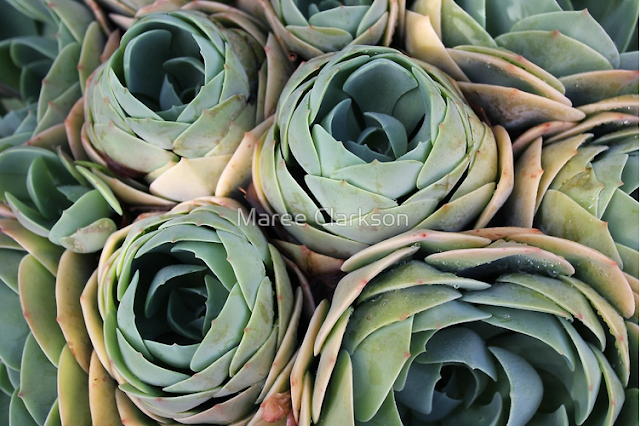 Although succulents are renowned for the fact that they can grow in poor soils and are drought tolerant, this Echeveria thrives in a good, rich potting soil and lots of water, as long as it also gets lots of sun. Unfortunately they are not very frost tolerant and every winter I bring those that are in pots into the house for winterizing. This is not ideal, as they tend to get leggy searching for more light and results in me cutting them down and replanting them every spring. Yep, I know that sounds a bit excessive, but the alternative is dead or frost-damaged plants that hardly ever recover before the next onslaught of winter.